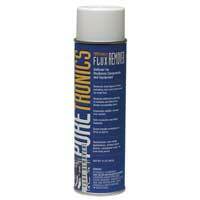 Flux Remover Plastic Safe - 13 oz. Removes most types of fluxes including rosin and rosin based no-clean flux. Restores electrical continuity of contacts and effectively cleans surrounding areas. Evaporates quickly, leaving zero residue. Safe on plastics and metal materials. Ozone friendly containing no CFCs and VOC compliant.